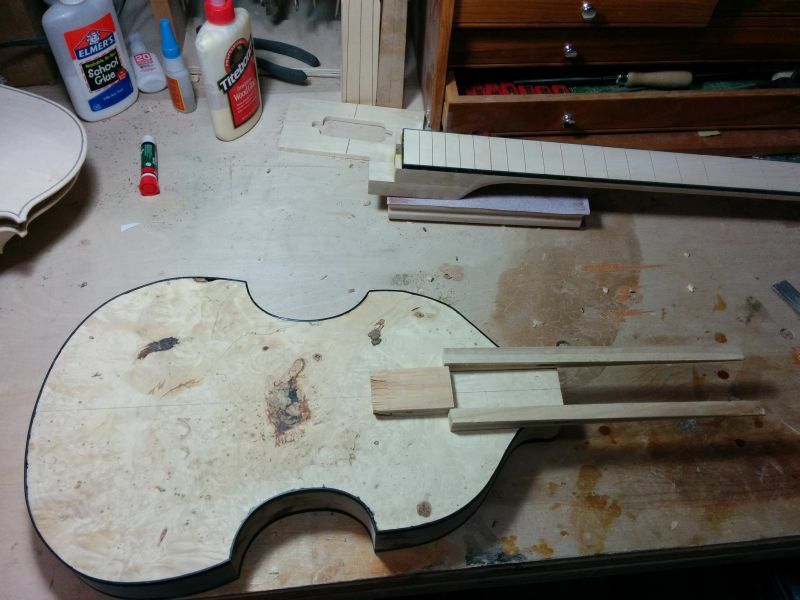 I recently finished my latest project, which was this short-scale bass guitar. 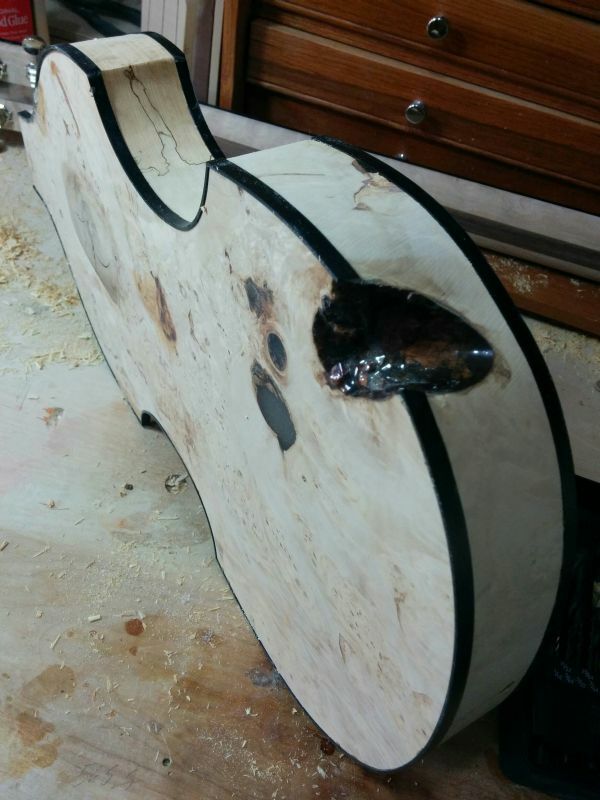 For this commission, I received a piece of box elder burl that had been roughly cut into the shape of a Hofner bass body. It has several large knots on the back of it, one of which is open and intersects the edge. My sense is that this chunk of box elder had been cut a long time ago and shaped only very approximately, probably just to “give the idea” of what was wanted. 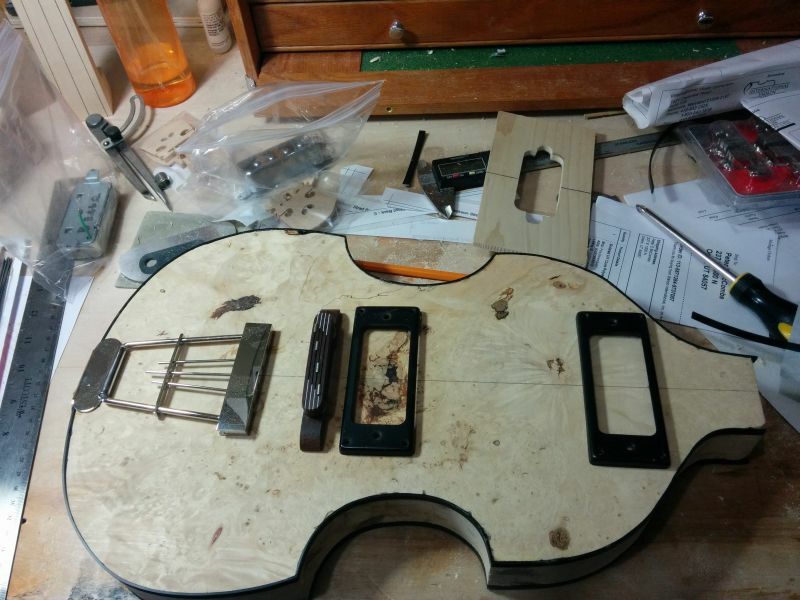 I did not have access to the original template, so I ordered Hofner plans from JAGuitars in London, England. Upon receiving the plans, I found that my body blank was an inch shorter than the one in the plan. I found that I could still use the scale length from the JAG plans if I compressed the layout a bit. That would spare me the hassle of recalculating frets. 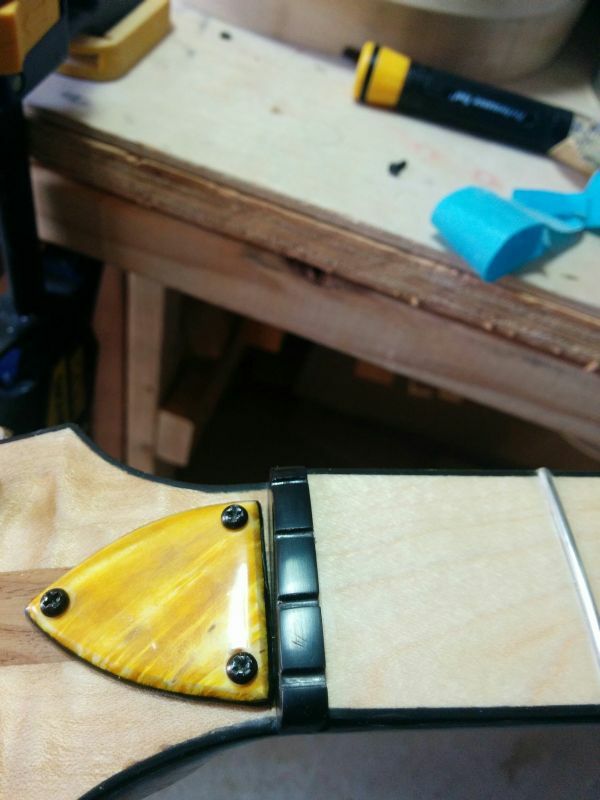 So, the neck pickup is closer to the upper bouts, while the bridge gets pushed slightly closer to the tailpiece. 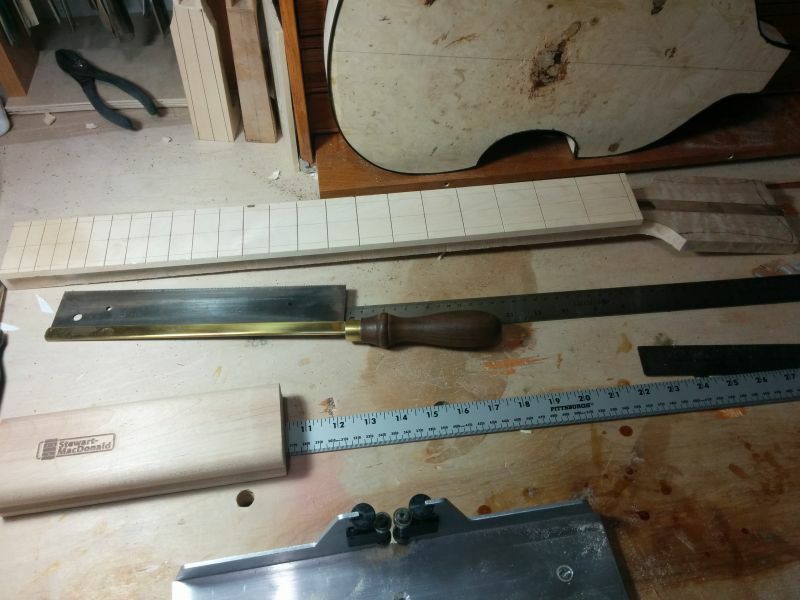 This arrangement called for a long neck tenon, which intrudes quite a bit into the neck pickup cavity in order to provide as much gluing surface as possible. The Hofner bass guitar is traditionally a hollow-body guitar, constructed after the manner of a violin. 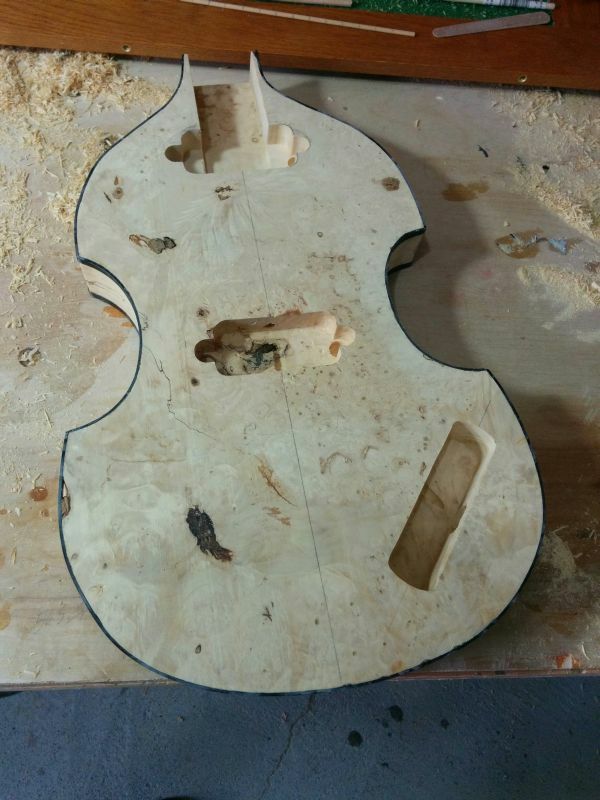 Sometimes it’s called a violin bass for that reason. 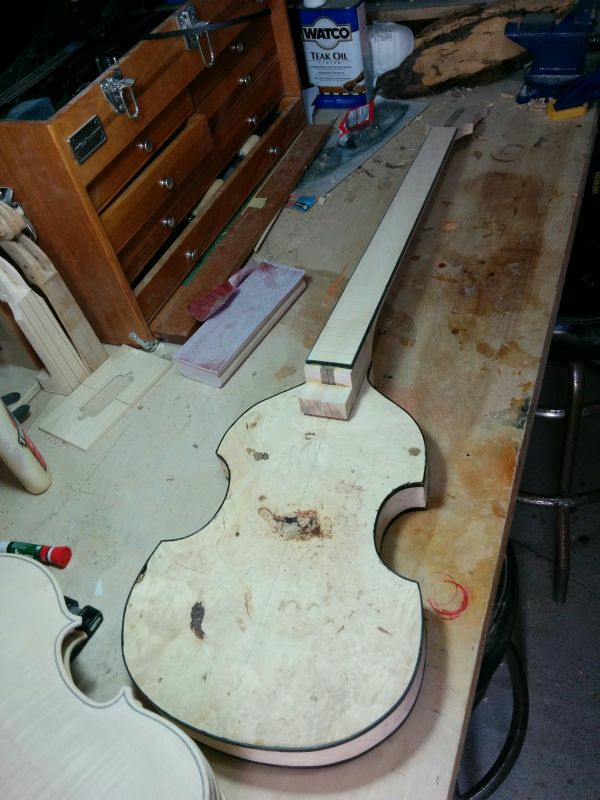 My version is a solid-body bass, and it’s not arched at all. I left all of the asymmetry in the body, not wanting to further reduce the size of it by trying to even everything out. All I did was to clean up the edges and put it through the thicknesser a couple of times. I’m installing black binding in this photo. Because this instrument has such a unique shape, I wanted to outline it with something bold. Installing binding around the knot. 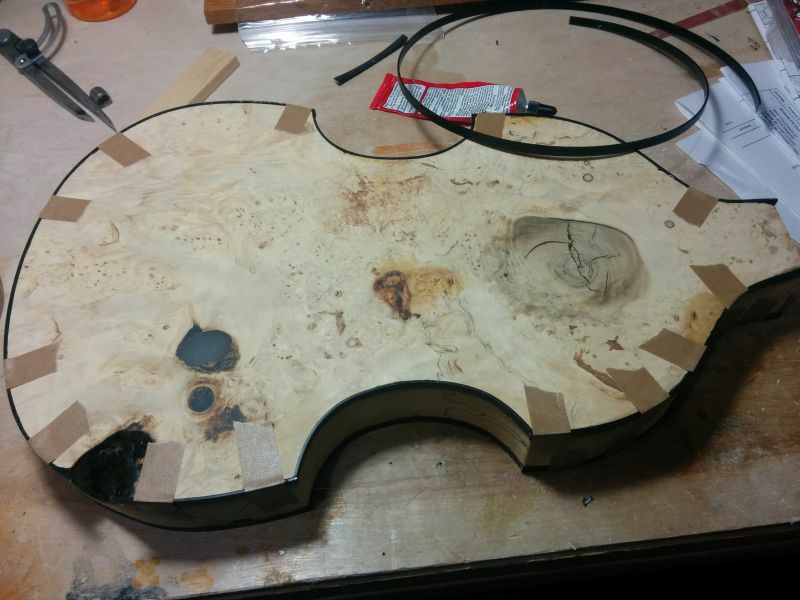 Since this is a burl, it came with a lot of holes in it. 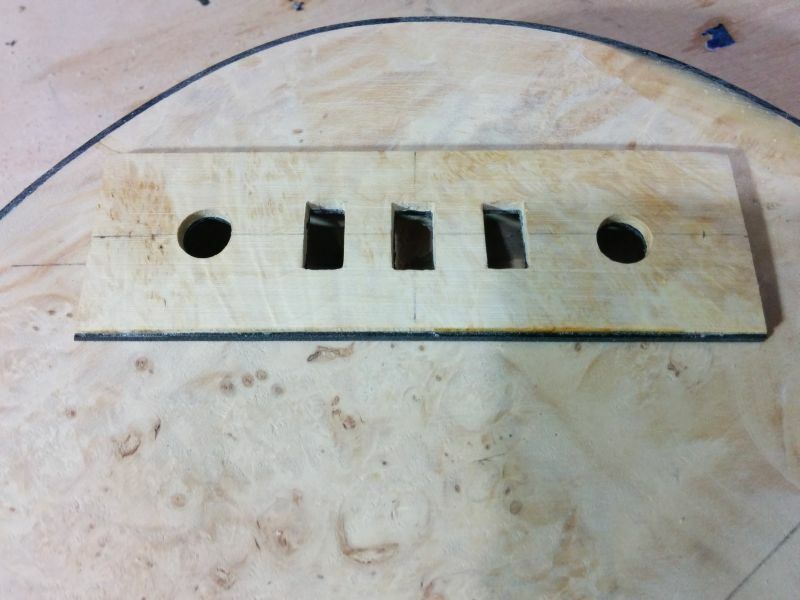 These holes I filled with epoxy before cleaning the edges and sanding everything flat. Detail of that edge knot. It’s my favorite feature on this instrument. Originally, I had hoped that maybe I could install the output jack in it, but it’s on the wrong side for that. 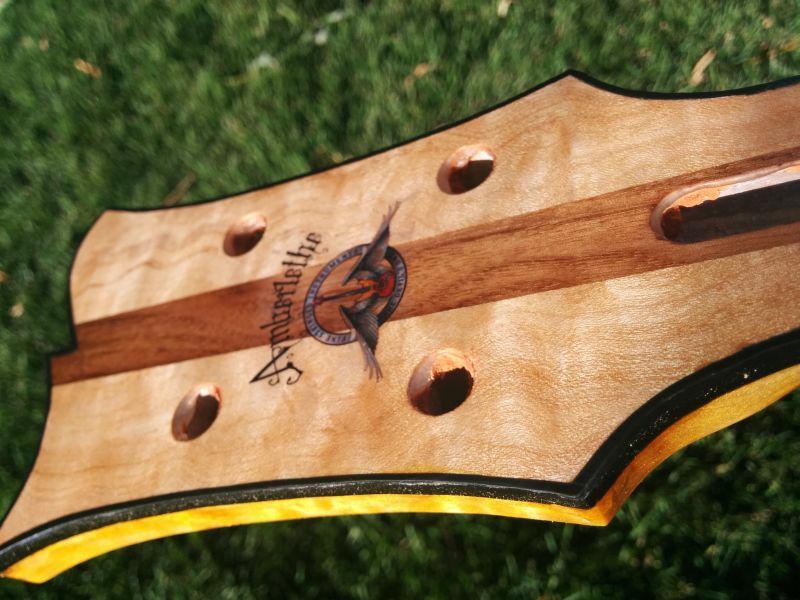 My customer provided the quilted maple for the neck, from a log he cut in Washington state. 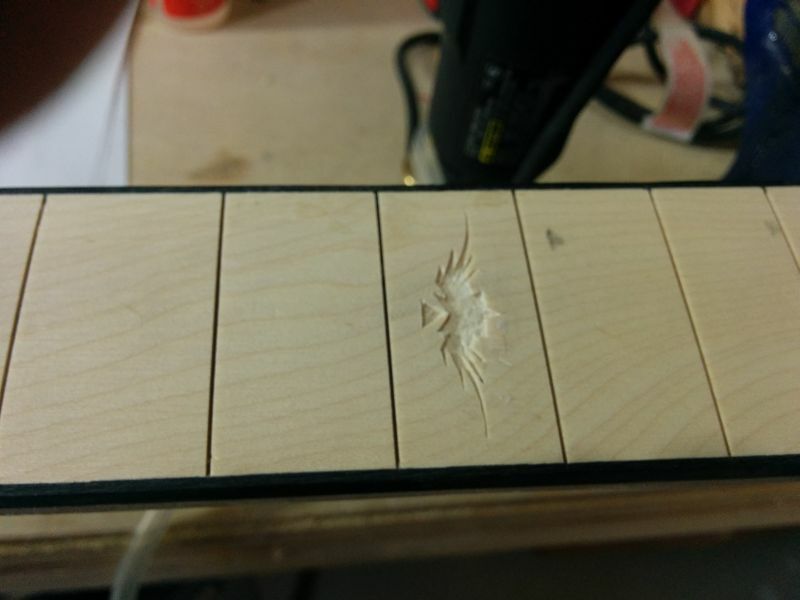 I milled some neck pieces out of it. I bought the walnut from a local lumber supplier. 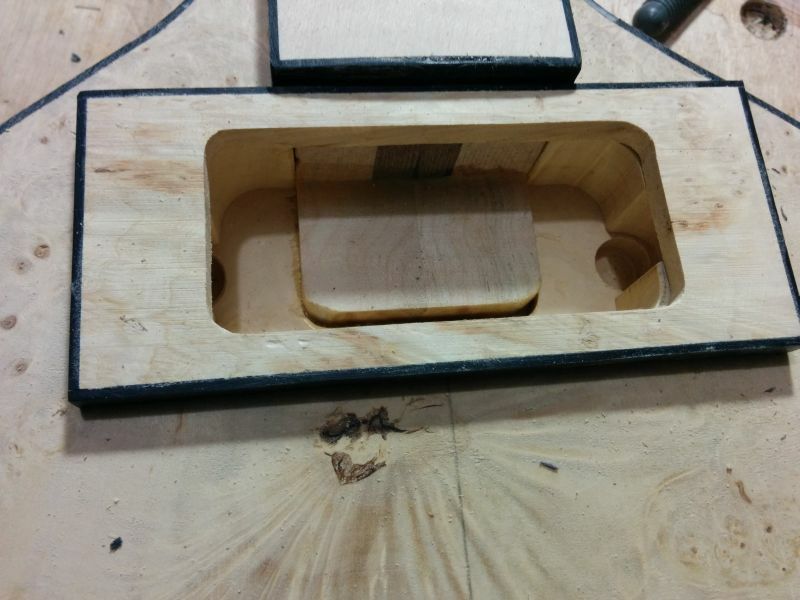 I used a piece of plain, hard maple for the fingerboard. I liked it because it was very bright and also quite plain. 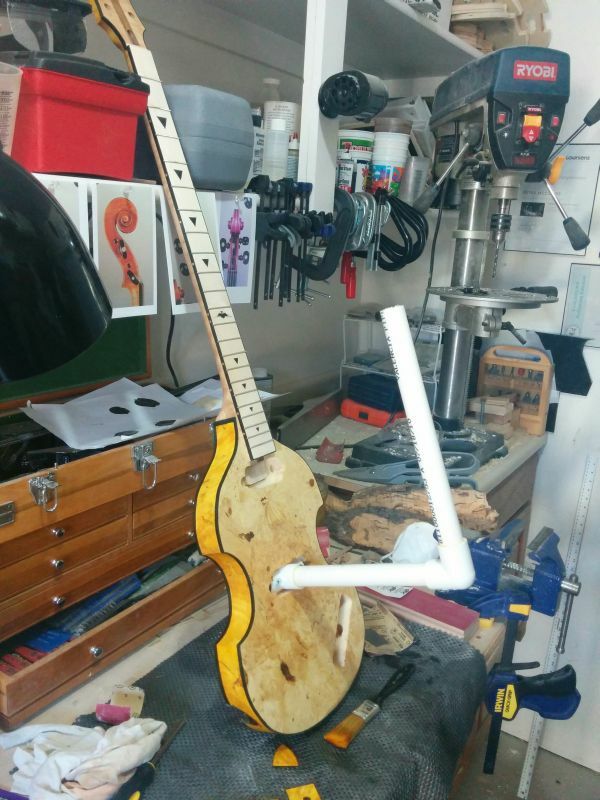 It offsets the fancy burl and the quilted maple of the neck. 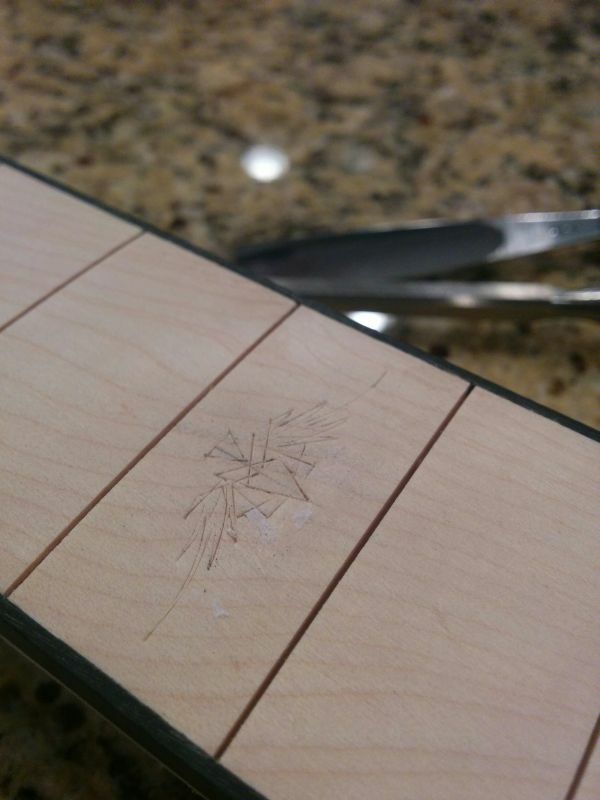 I didn’t use a template for slotting the frets, I just made sure I measured really well and cut exactly on the marks. 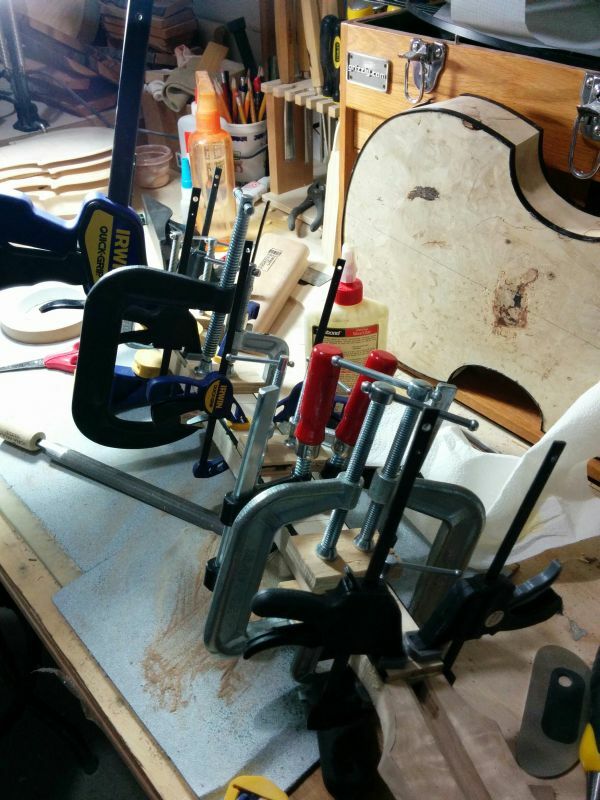 I used about every clamp in the workshop to get the fingerboard attached. To get the right neck angle, I just modify door frame shims. Each wedge is about one degree. I stacked three of them in order to get the three degree neck set that I wanted. 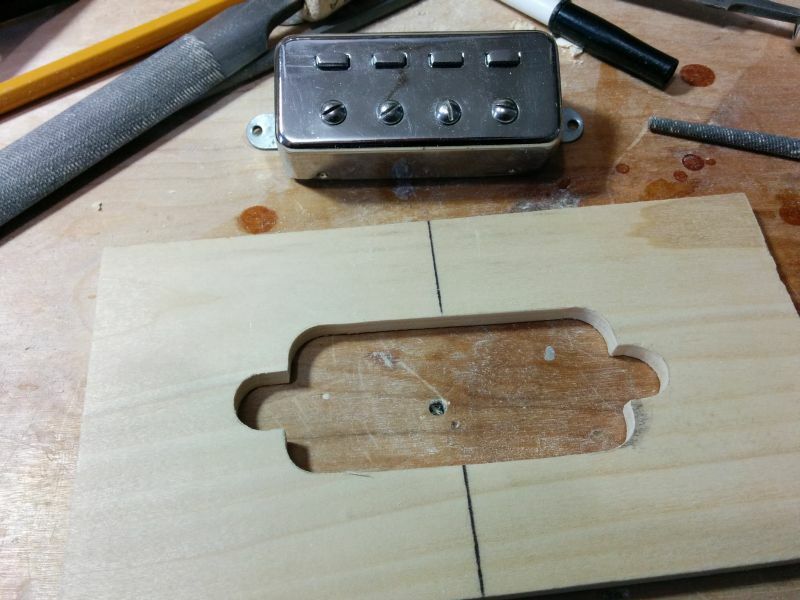 For the pickups, I had to make my own routing template. I just traced a pickup onto a piece of wood, and then Icut it out. Here I’m testing the layout to make sure everything will fit right. 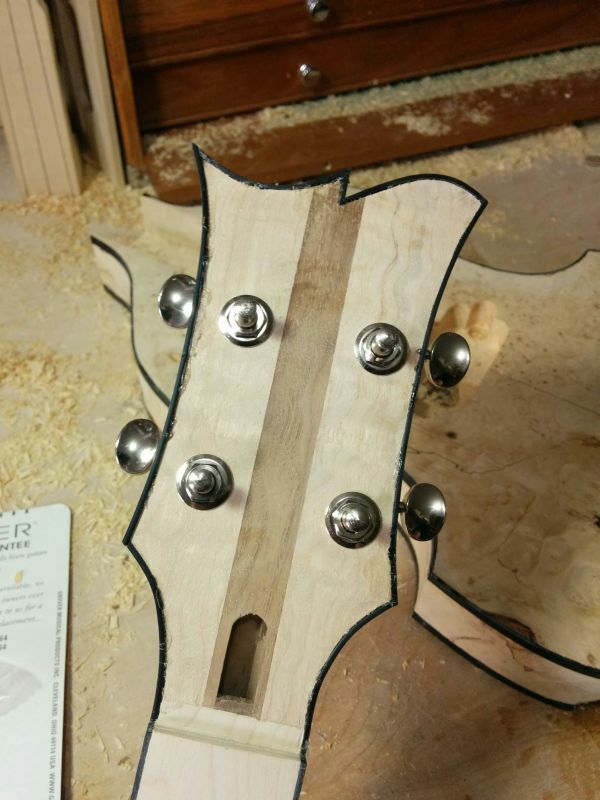 Testing the fit and position of the tuning heads. 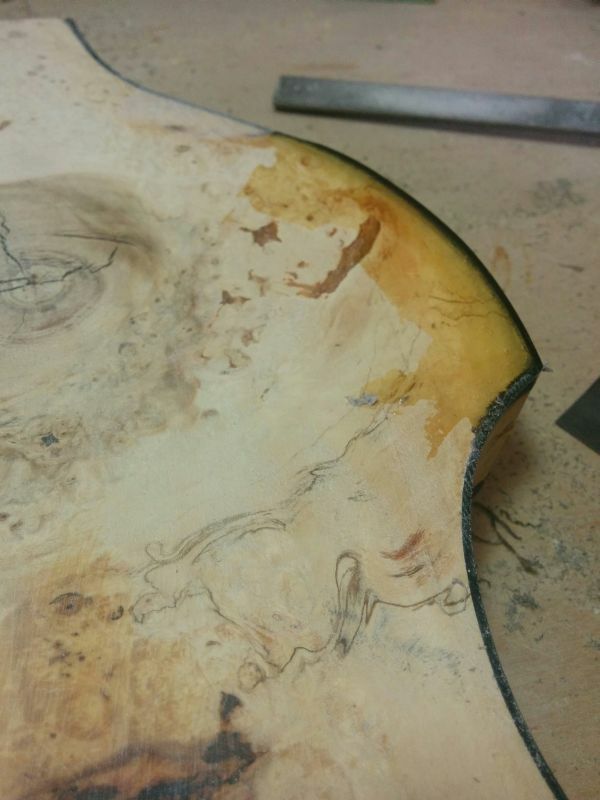 Since this was a rough-cut burl, there were places around the edges that were not quite up to the level, even after thicknessing (I didn’t want to take it too thin). 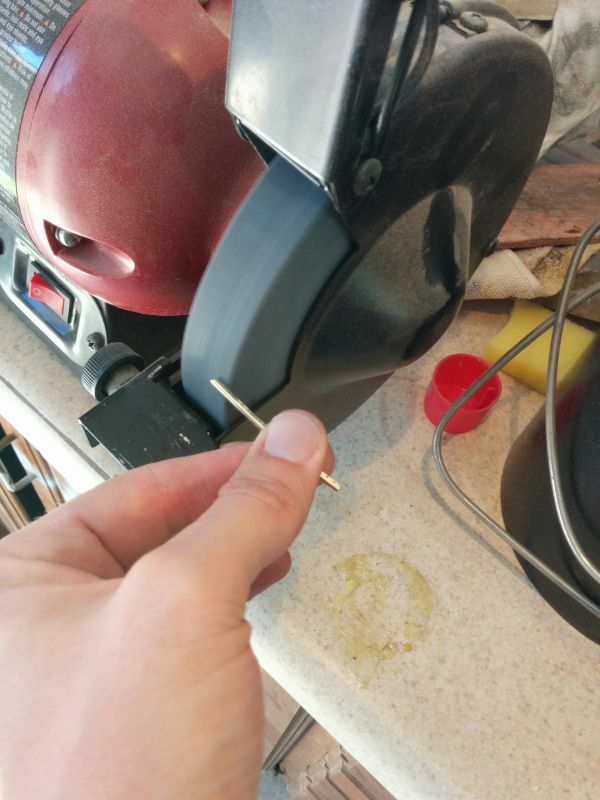 So I filled in with epoxy here. That way, the binding stays consistent. It’s not very noticeable, although I found that it fluoresces under UV light. 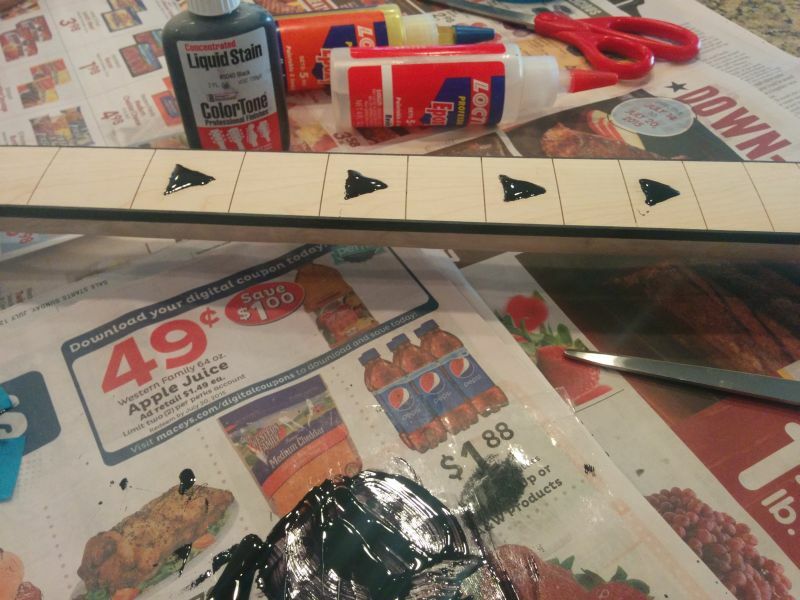 My wife suggested that I use natural wood fret dots. 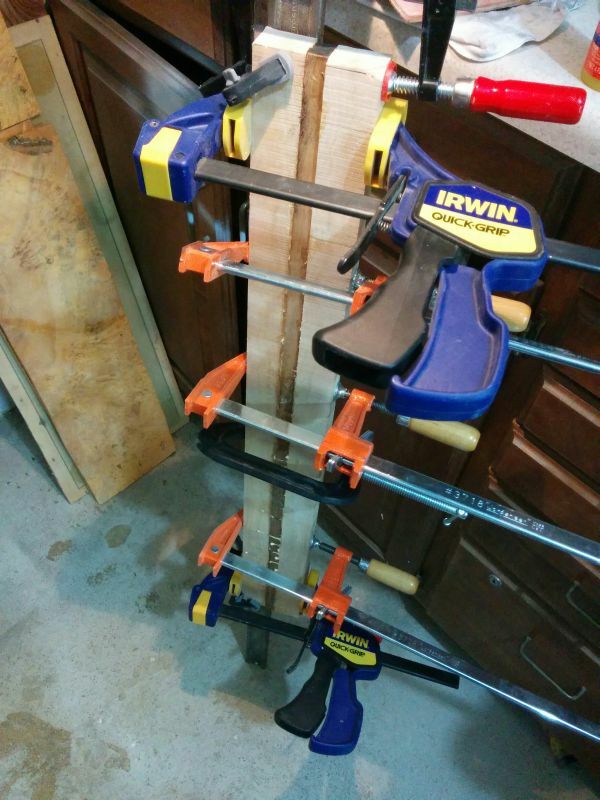 I had some spare dowels from my old AVS project. I used those. 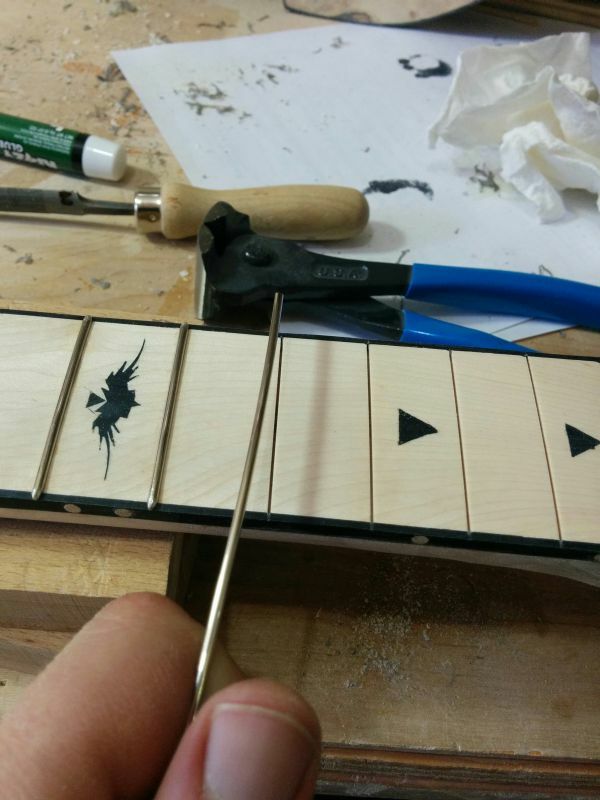 Here I begin the process of hand-cutting the 12th-fret inlay. This was one of the funnest projects. 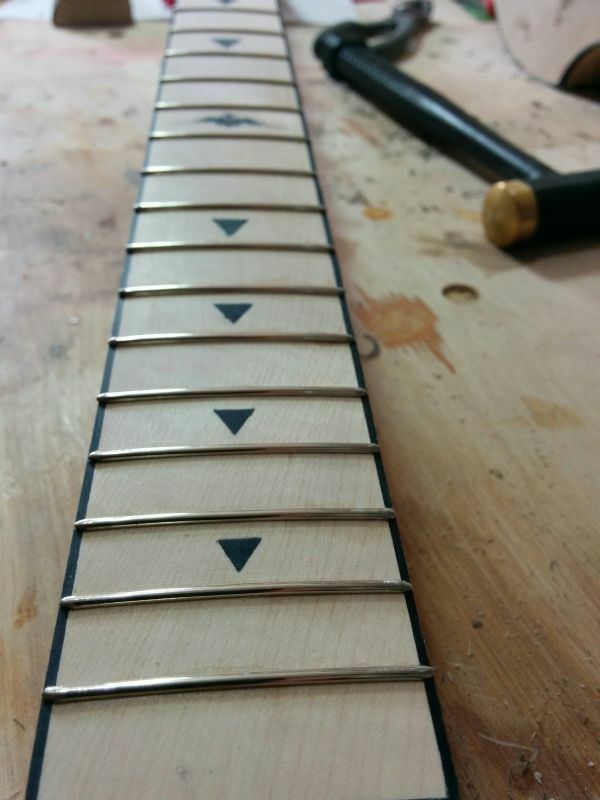 The 12th-fret inlay has been hand-cut. 49-cent apple juice! Also, I’ve mixed my own inlay material and drizzled it into the recesses I had cut into the fingerboard. I’m rounding fret ends on the bench grinder. Installing fretwire. Note the nicely rounded blind ends. Here I’m working out the electronics cover plate. 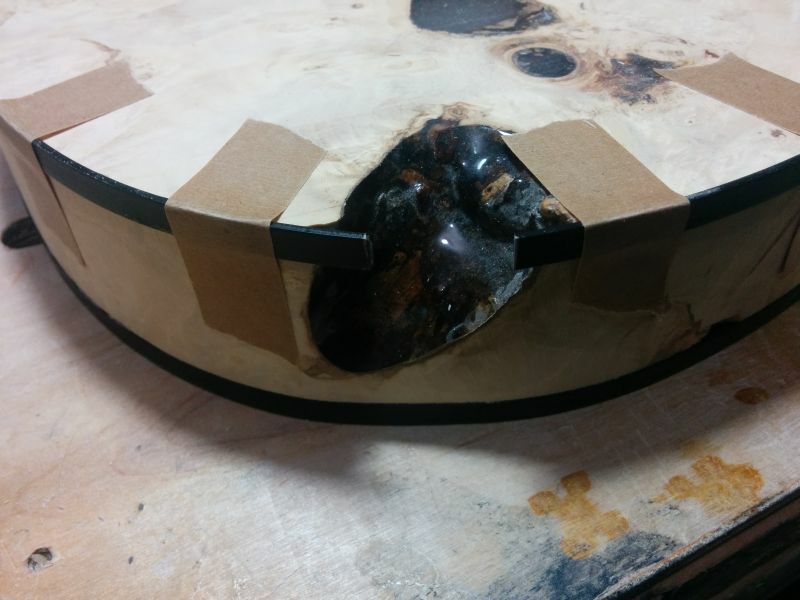 I cut and laminated some scrap burl over black plastic sheet. Here is one of my pickup rings, hand made. 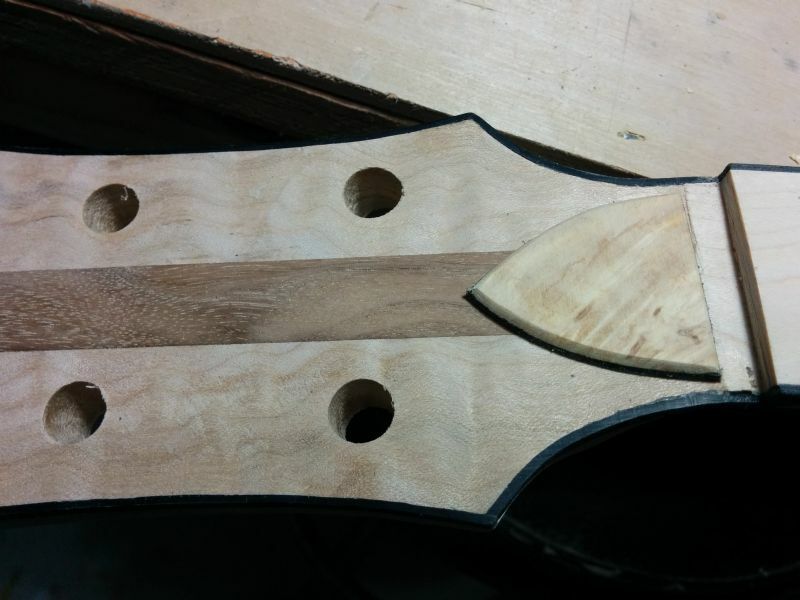 This is the cover I made for the truss rod access. I mixed powdered gamboge with alcohol and wiped it on for the intense yellow color. I found that my clear coat was not compatible with this base color, so I had to tone it down and spray it with acrylic sealer before the clear coat would take. This is my varnishing rig. 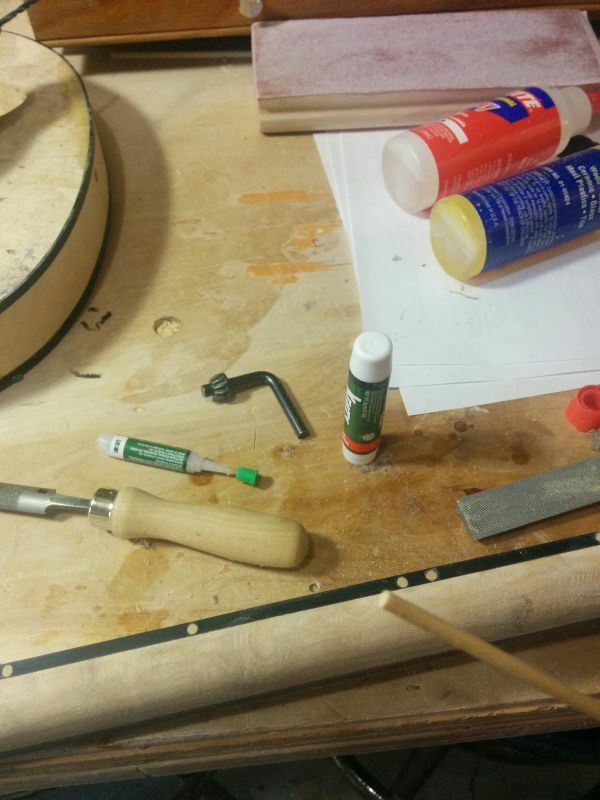 The PVC pipe acts as a handle that I can clamp in the vice while I brush on the finish coats. I’ve put on my decal and painted on the polyester clear coat. It cures in the sun, in about three minutes. I learned the technique from Chris Monk of Highline Guitars. 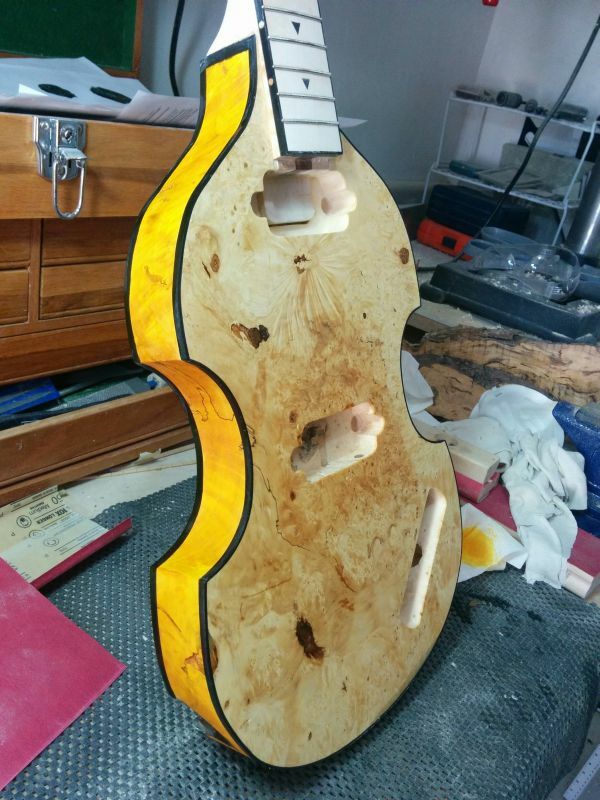 The polyester resin makes a great guitar finish, but I will need a lot more practice before I’m efficient with it. Here is the nut I made out of a piece of black bison horn. 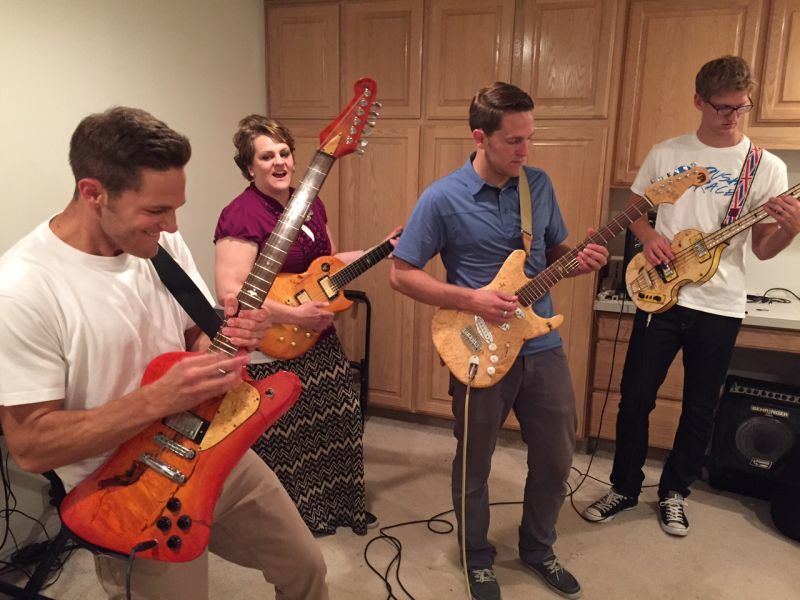 My favorite picture: My guitars being played! These guys have made, and recorded, some amazing music.